Noctis Lucis Caelum is the main Character in Final Fantasy XV. 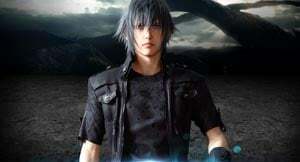 Heir apparent to the Lucian throne, Noctis's trials begin when he sets forth from the crown city in order to wed the Lady Lunafreya Nox Fleuret. In combat, he wields spectral weapons which he forges from thin air, a power possessed by those of his royal line as well as being the only party member able to wield Ring Magic. He can use the special ability Armiger Arsenal in Combat if he has 1 of the proper Swords for it. As the only character capable of wielding every Weapon class, in addition to Ring Magic, he is the most versatile party member and can perform in many of the different typical Combat roles.